Buying a Habitat home takes hard work. 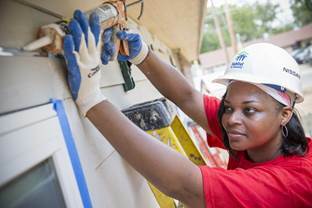 Homeowner candidates contribute “sweat equity” building their home and the homes of others in partnership with volunteers and contractors. In addition, Habitat homeowners participate in a series of educational classes designed to prepare candidates for successful homeownership. Rather than a “hand-out” a Habitat home is truly a “hand-up”, allowing homebuyers to build skills for a solid future.